There are records stating that the Swiss family Meyer arrived in Katzenthal in 1732. Domaine Meyer-Fonné dates back three generations with FÉLIX MEYER, the current incumbent, taking over the cellar from his father in 1992. 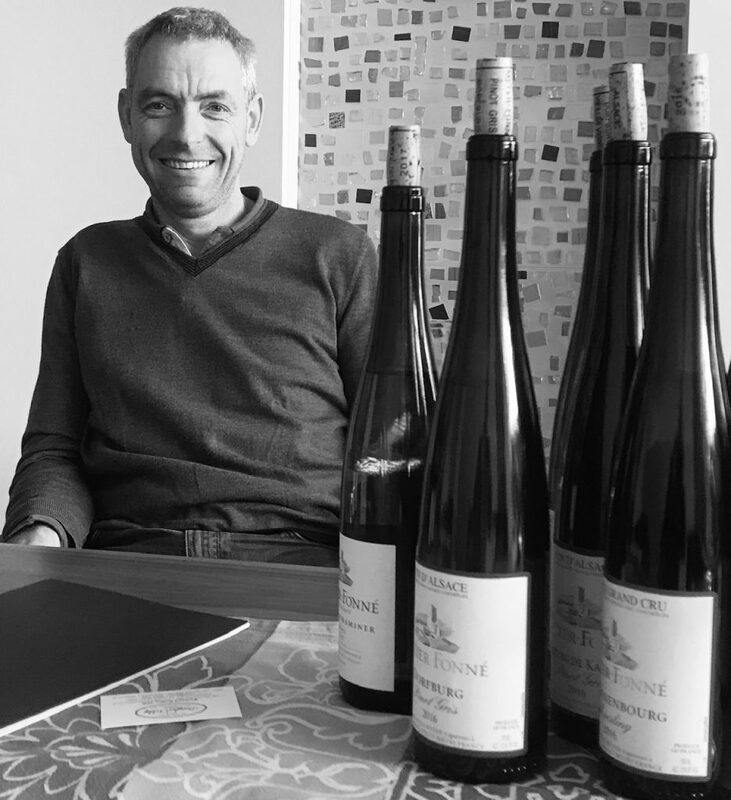 Having first modernised the equipment in the winery, then developing export sales, Félix is now expanding the family holdings in many of Alsace’s great vineyard sites. Today, he works 15 hectares over seven different communes, including five in notable Grand Cru locations. Félix believes in raising his wines on fine lees in large, older foudres, as is the tradition in Alsace, although he doesn’t eschew the use of stainless steel for certain parcels and varieties. The non-aromatic varieties tend to ferment and age in foudre with the aromatics consigned to stainless steel. The tendency is to vinify the identical plot in the same vessel each vintage. Regardless of the cuvée or cépage all the wines are defined by their elegance, delicacy and refinement and, for the most part, all are vinified dry. In the vineyards, Félix is increasingly interested in organic farming, with everything currently in conversion. No synthetic fertilizers, herbicides, or pesticides are used to treat the vines. Cover crops are planted in every other row in the vineyards. Some vineyards are ploughed, although generally just once a year. Any more would simply erode the soils. He treats the grapes with the same individualized care, harvesting by hand and gently loading them into the press. The use of native yeasts during fermentation makes the process longer and slower but creates a more textured finish. This is a distinguished Edelzwicker blend, containing at least 50% of the ‘noble’ varieties of Riesling and Muscat, with Pinot Blanc making up the balance. The wine tends to be a blend of the same proportions and parcels each vintage. With just two grams of residual sugar, the wine is technically dry. Very delicate nose. Faintly floral with the Muscat very discreet and no obvious single varietal character. Lovely and delicate to the palate with a notable Riesling-like linearity. Floral and delicate. The wine is a blend of Pinot Blanc, Pinot-Auxerrois, with 15% Pinot Gris from a parcel of co-planted vines with the grapes fermenting together, since they all ripen at the same time. Half the wine is fermented in foudre, the rest in stainless steel. Intriguing, well-defined and elegant nose with a real purity to the Pinots expression. Clean, pure, dry (1-2g/l RS) and mineral on entry. Excellent tension and focus. Very fine and delicate. This is lovely. This is one of six different Rieslings commercialised at the domaine. Half of the Réserve comes from a clay and red sandstone soils in Riquewihr, and half from the granite soils of Katzenthal and the neighbouring villages of Ammerschwihr and Kientzheim. This almost has a Mosel-like delicacy to the nose and shows some positive evolution. The palate is much drier than the nose suggests and retains freshness and delicacy. Serious, chalky and very refined. From 20 to 60 year old vines grown on the granite soils of the Wineck-Schlossberg, the Grand Cru sited directly behind the village of Katzenthal. The vineyard stretches over 27 hectares with a south-south-east orientation. Some 70% of the Grand Cru is planted to Riesling. Very refined nose. Delicate, open and approachable yet with more to give. Crystalline and precise. Light and feminine. Very good length and a delicate finish. This is very fine. At just 4% of the vineyard area of Alsace, Muscat remains the most confidential of the ‘noble’ varieties planted. This is a blend of both Ottonel and à Petites Grains and comes from two sites within the commune. Lovely pure, mineral nose displaying its granite-specific site. Gravelly, but with the lovely grapey texture one associates with Muscat. Light on entry. Builds well. Excellent focus. Pure and delicate, with a lovely juicy quality to the finish. A thread of acidity runs laterally through the palate. Chalky textured, with a noticeable and lingering phenolic grip. This wine is sourced from selected sites in Katzenthal, Riquewihr and Ammerschwihr. Half the vines are grown on clay and red sandstone-based soils, with granite and limestone making up the balance. This displays a very pure expression of Pinot Gris, whilst remaining very fine and delicate. At the same time, the wine retains real texture and precision. There is also a racy quality, not often associated with the variety and a distinct mineral presence on the finish. Located in Ammerschwihr, Kaefferkopf is the newest Grand Cru in Alsace. Upgraded in 2007 and covering a total of 71 hectares, it is also one of the largest. Pinot Gris represents just 9% of the surface area, with Gewurztraminer and Riesling being the most widely planted. Historically, however, Kaefferkopf was most associated with its blended Edelzwicker wines. Today, Félix Meyer is one of around a hundred growers who exploits the granite and limestone soils. Currently a little closed on the nose and somewhat hidden at this stage. The palate, however, shows much more definition and varietal character. It’s much cleaner and precise than the nose suggests. There is some mid-palate weight here, but it is defined by the thread of acidity running through its core. There is a positive mineral profile and develops a second tier on the finish. Chalky with a faint CO2 presence, there is a touch of characteristic orange-peel flavours to the finish. Approachable, but understated yet still intriguing at this stage, it will be expected to develop further over many more years. One of six different examples of the grape variety released by the domaine. This comes from young vines (less than 20 years old) located in specific lieux-dits and Grand Cru vineyards. Half the vineyards are based on clay and red sandstone soils; the balance is sourced from granite and limestone sites. From a very small harvest year. Very good varietal definition. Earthy, mineral. My notes read ‘Lovely, really lovely…’ Pure with excellent focus and balance. The delicate texture complements and completes the house style. Faintly pithy on the finish. Excellent. From a 24 hectare vineyard in Riquewihr, Grand Cru Sporen has historically been famous for the quality of its Gewürztraminer, with first dating back to 1432. Its deep, clay rich soils are perfect for the growing of the variety, although Pinot Gris also has a notable presence here too. This comes from different plots of vines planted on limestone and granite-clay based soils. The grapes are de-stemmed and enjoy a two-week maceration, using both pigeage and remontage for gentle extraction. The wines are raised in second to fifth-fill oak barriques for 11 months before bottling. Light, pure delicate fruit. Good structure and grip. Noticeable, but supple tannins. A very modern style. Approachable now but will age further.